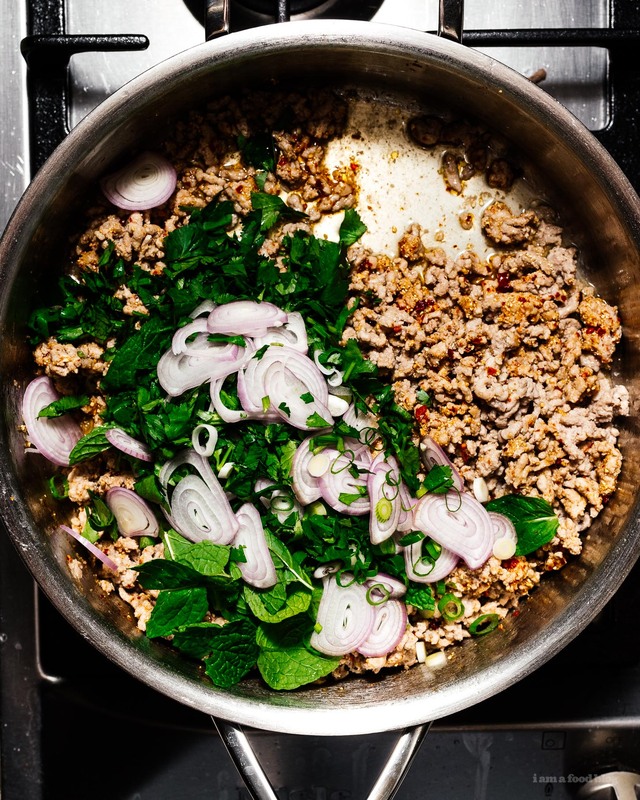 If you’ve been to northern Thailand or Laos, you’ve probably had larb moo, or meat salad. It’s unofficially the national dish of Laos and incredibly popular in the Isan region of Thailand. Meat salad might not sound very appealing, but it’s incredible. Think: juicy minced pork, fish sauce, lime juice, roasted rice, and fresh herbs. Paired with sticky rice balls, it’s absolutely addictive. 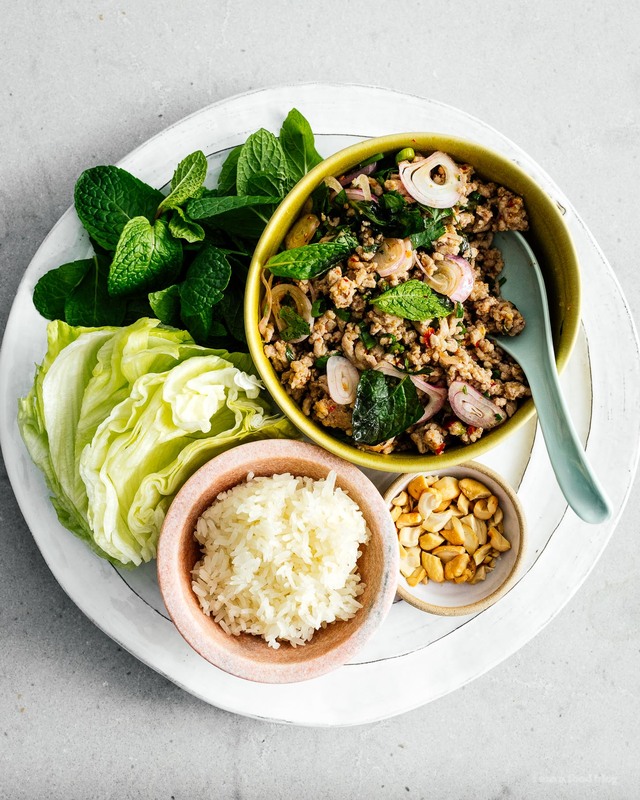 The essential ingredient in larb is the toasted sticky rice. It gives everything a nice crunch and roasted toasty fragrance. If you don’t have sticky rice, you can easily toast up some uncooked Jasmine rice instead. 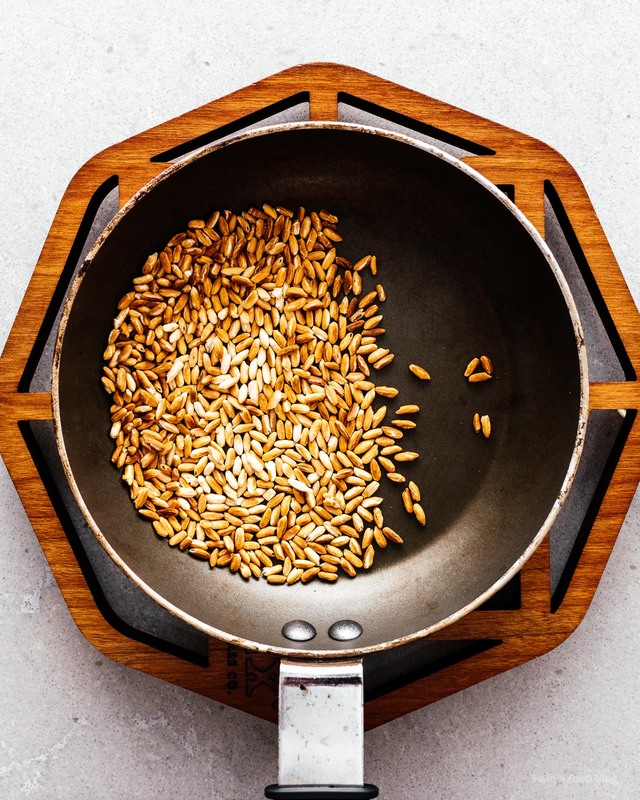 Toasting rice is pretty easy: just pop uncooked rice into a dry pan and toast over medium low heat, while shaking occasionally. After a while, the rice takes on some color and starts to smell amazing – kind of like popcorn. Take your time while you’re toasting, be careful not to burn. Toasting the rice is probably the longest part of this recipe. After that you’re just 10 minutes away from porky, herby heaven. Larb is classic street food, fast, easy, fun, and most importantly, delicious. It’s usually served with vegetables, lettuce to wrap, and sticky rice – so good! We had ours with both lettuce cups and sticky rice. Sticky rice recipe coming soon! 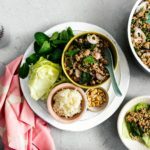 The next time you’re looking for a quick and easy dinner that’s a bit different, I hope you try this larb. It hits all the right notes: sweet, spicy, salty, and sour. In a small pan, toast the rice over medium low heat, shaking the pan often, about 2-3 minutes. 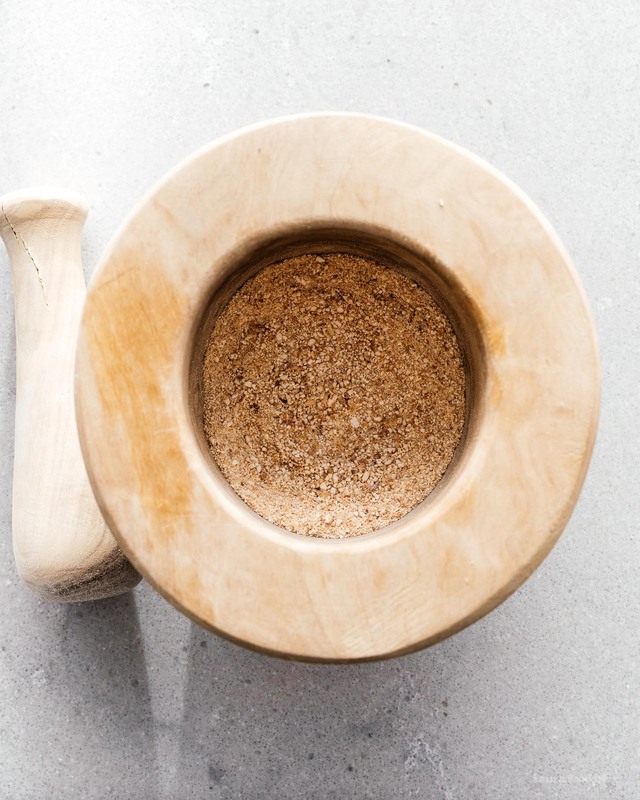 Once golden brown, let cool slightly and move to a mortar and pestle. Crush it into a fine powder. Transfer to a small bowl and set aside. 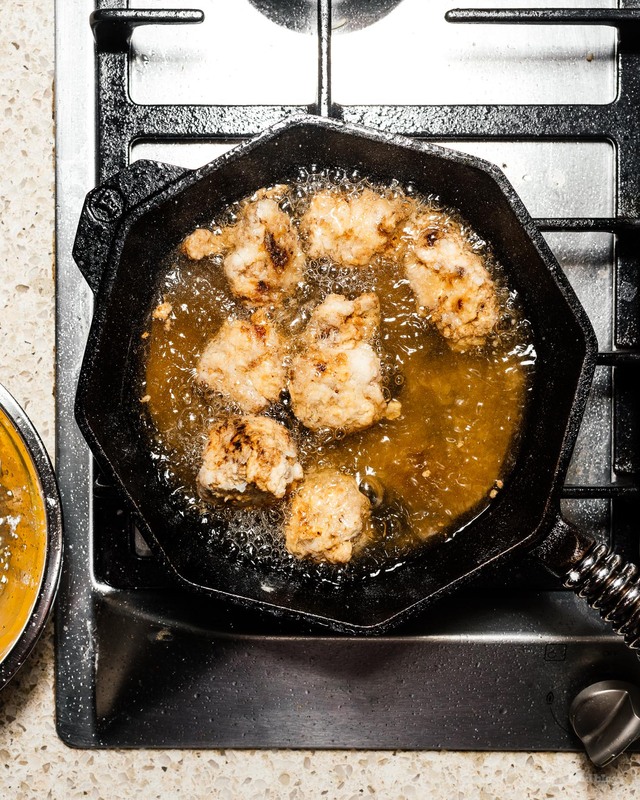 In a skillet, heat the oil over medium high heat. When hot, add the pork, and brown, breaking into pieces. Remove from the heat, and stir in the toasted rice powder and chili flakes. Add the sugar, fish sauce, and lime juice. Stir in the shallots, green onions, cilantro, and mint. Mix well and adjust to taste. 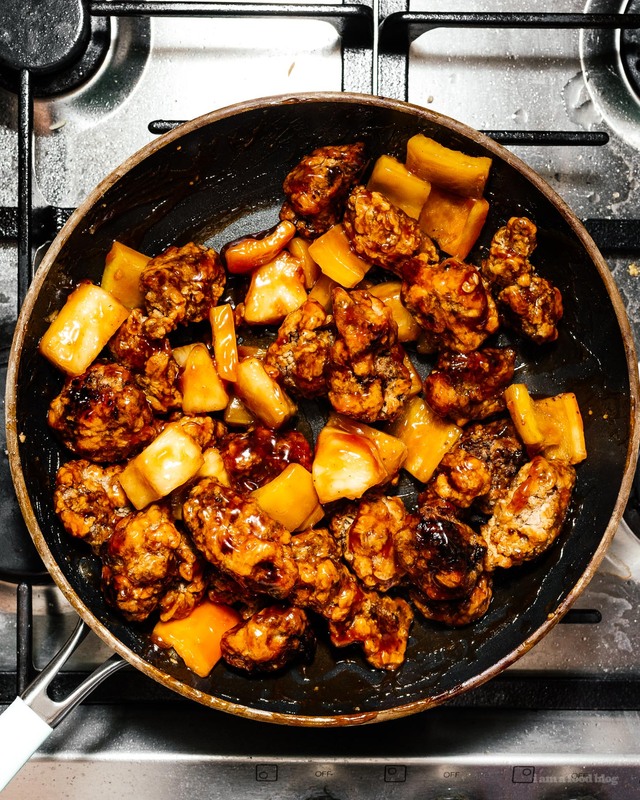 Everyone knows and loves sweet and sour pork, right? Some people don’t know that sweet and sour pork is totally deep fried and not all that healthy. This is an easy, healthy, just as delicious homemade version with no added oil and no deep frying. The sauce is as authentic as you’d find in any Chinese household or restaurant, and this was so good the two of us demolished over a pound of it in under 10 minutes. Is that ketchup in the ingredients list? Yes. 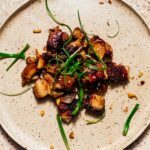 Not only was ketchup invented in China anyway, it’s perfectly normal to use and is pretty much the accepted standard method to get that unique tanginess you find in sweet and sour pork. If you want the pork crispier and you have a can of cooking spray such as pam handy, hit it with a light coat of oil before you dust with corn starch to get even more crunch. A baking sheet with a rack that fits and a non stick pan. 1. 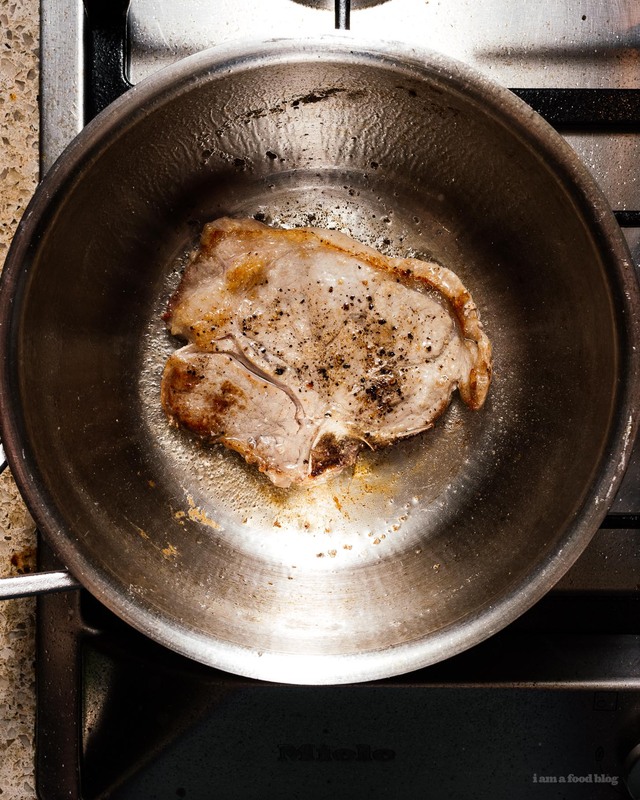 Preheat your oven to 450ºF and season your pork with salt and pepper. 2. 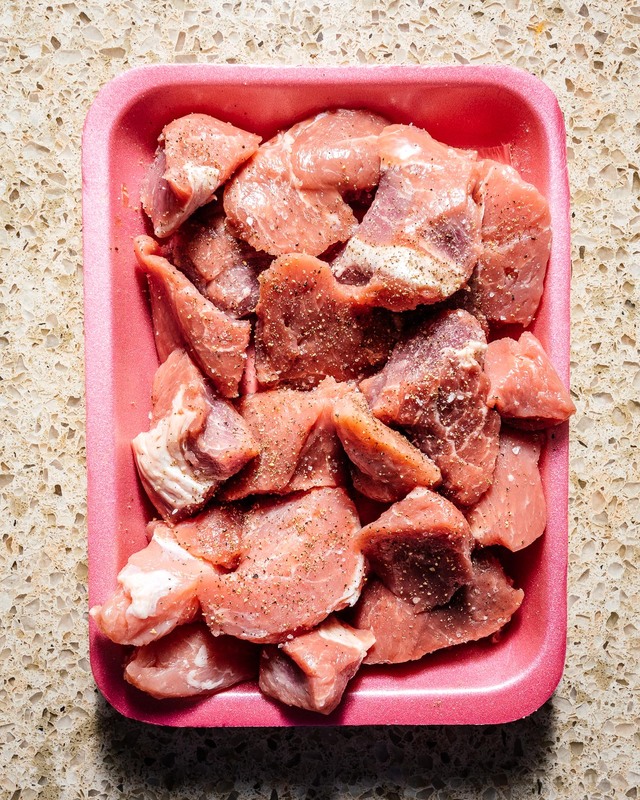 Transfer your pork to a plastic bag or ziploc bag along with 1 tablespoon of cornstarch. 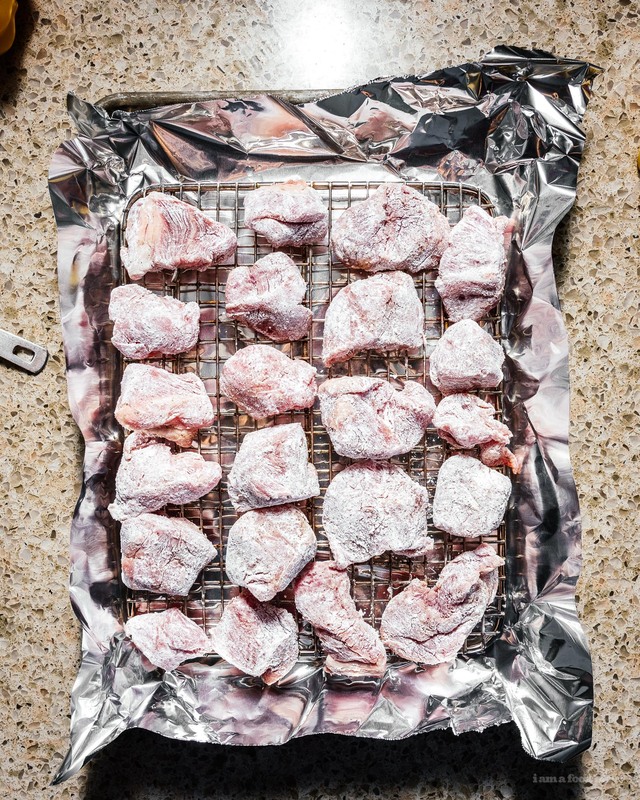 Shake well until the pork is lightly coated and then place on an oiled tray in a foil lined baking sheet. 3. Bake your pork for 40 minutes, flipping once after 20 minutes. 4. While the pork is baking, add the remaining 1 tablespoon of cornstarch to 1 tablespoon of water in a cup and stir until a smooth slurry forms. 5. 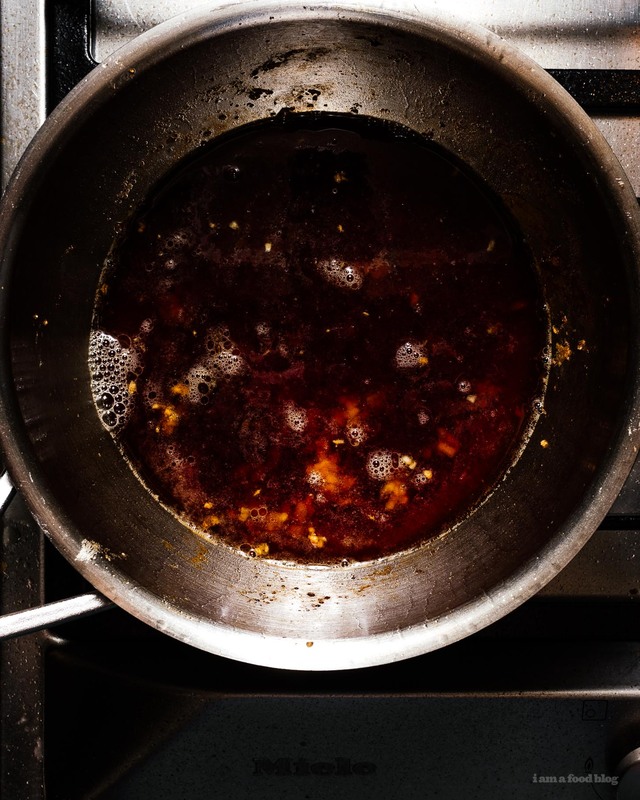 Make your sauce by adding sugar, ketchup, vinegar, soy sauce, corn starch slurry, and 1/4 cup of water to a pan and bringing it to a boil. Once boiling, turn the heat to low and add your vegetables. Cook until your desired doneness and then remove from heat (for us that means almost raw). 6. Add your pork to the sauce and toss until well coated. Enjoy! 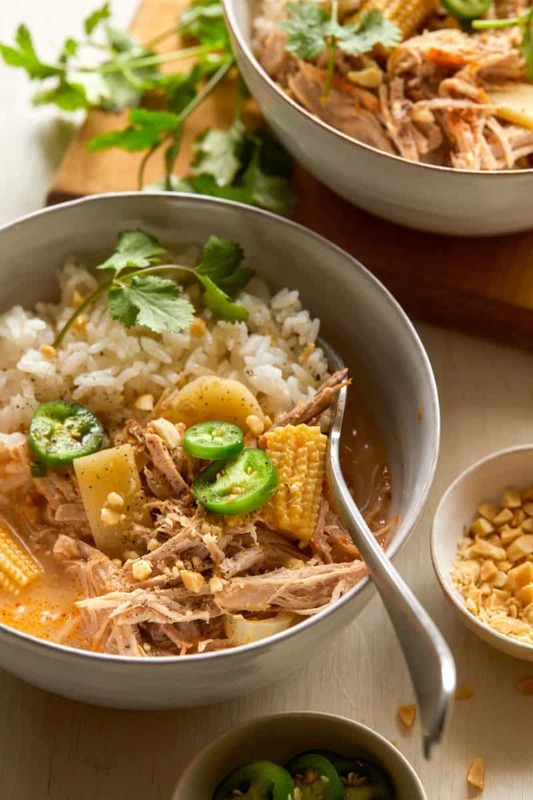 We are so excited to share this super easy slow cooker recipe with you today! 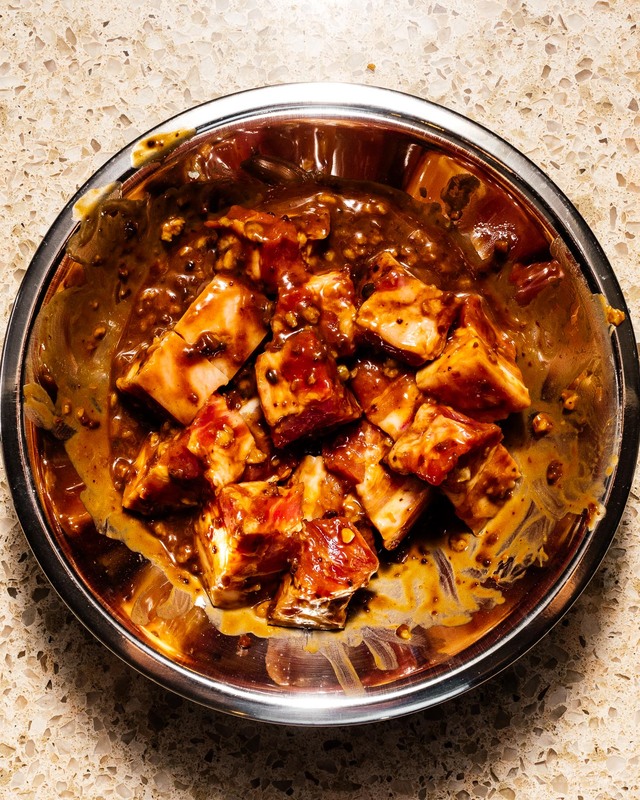 We love using our slow cooker when work is especially crazy. Every little bit of time saved is a really big help. When it’s cold outside (it’s been raining so much here in LA! It’s been nuts!) we crave hearty dishes. 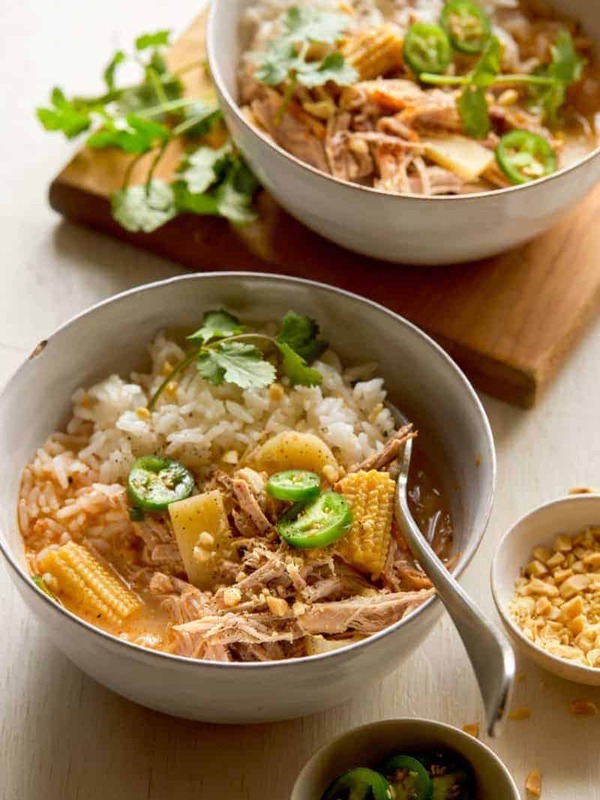 We love this Shredded Pork Coconut Curry because it’s super filling and makes great leftovers. We used the Smithfield Sweet & Smoky Marinated Fresh Pork Roast in this recipe because it’s conveniently pre-seasoned, yummy, and made from 100% fresh pork with no artificial ingredients. It really helps cut the time down on the prep for this recipe. 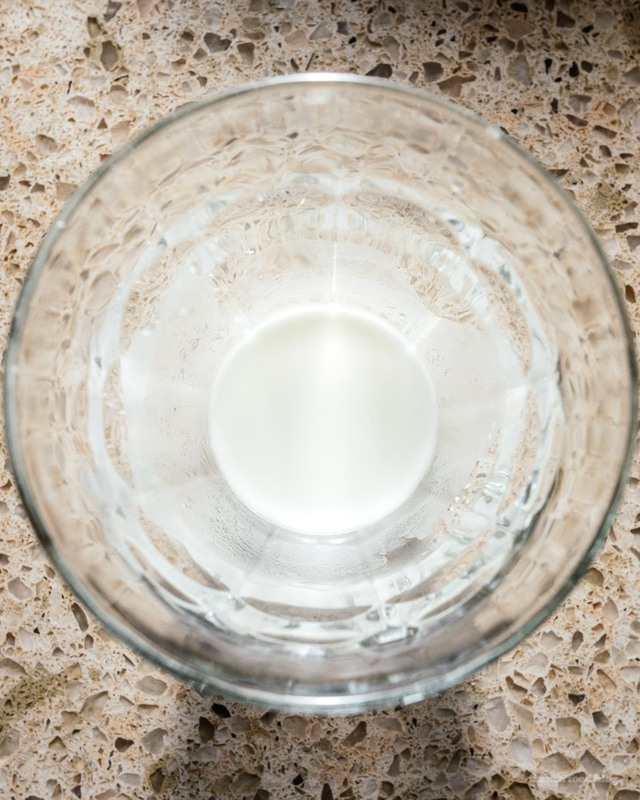 Smithfield is helping at-home cooks like us get out of our regular dinner rut and get creative in the kitchen with the Smithfield “Shake It Up” Contest. 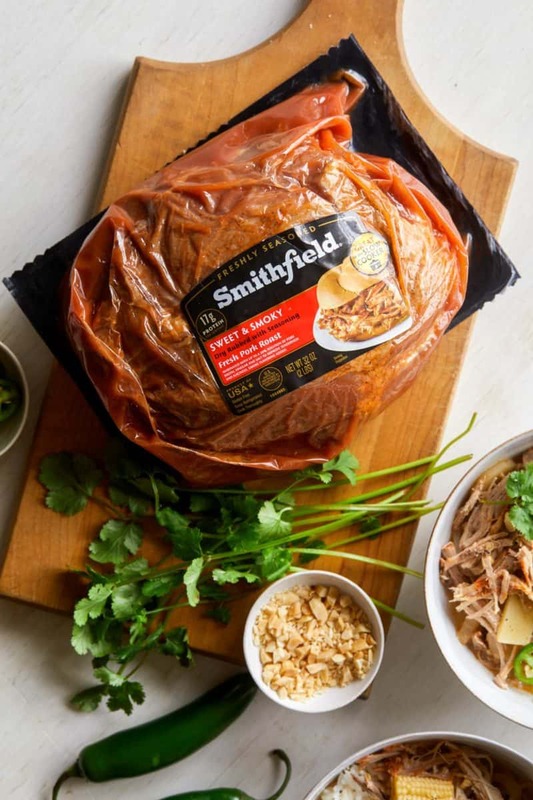 From now through April 26, visit Smithfield.com/ShakeItUp for more details, and to submit a photo of your original dish along with a brief description on how you shake up your go-to recipes with Smithfield Fresh Pork instead of beef or chicken. You can also visit Smithfield.com and get some other quick and easy recipes that are perfect for weeknight dinners. Available in a wide variety of cuts and flavors, you can find Smithfield Marinated Fresh Pork products at local grocery stores including Walmart, Publix, Food Lion, ShopRite, Albertsons/Safeway, and Save A Lot. We hope you enjoy this one! 1. Place half of each the sliced onion, garlic and ginger into a 4 to 5 quart slow cooker. 2. Add quartered Smithfield Sweet and Smoky Marinated Fresh Pork Roast to slow cooker and pour 1 ½ cups chicken stock over pork roast. Season mixture with salt and pepper. 3. Cover slow cooker with lid and set to high. Cook pork roast for 4 hours. 4. Remove lid from slow cooker and transfer pork to a plate. Discard liquid mixture. 5. Add remaining onion, garlic and ginger to slow cooker and top with reserved pork. 6. Pour remaining stock over pork, followed by bamboo shoots, water chestnuts, baby corn, and diced serrano. 7. Place lid back over slow cooker and cook on high for an additional hour. 8. Uncover slow cooker and completely shred pork with two forks. 9. Stir coconut milk and lime juice into shredded pork mixture, season with salt and pepper and cover. Cook for 10 minutes to heat coconut milk, then adjust seasonings and stir. 10. To serve: Scoop steamed rice into each bowl and top with a ladle or two of curry. 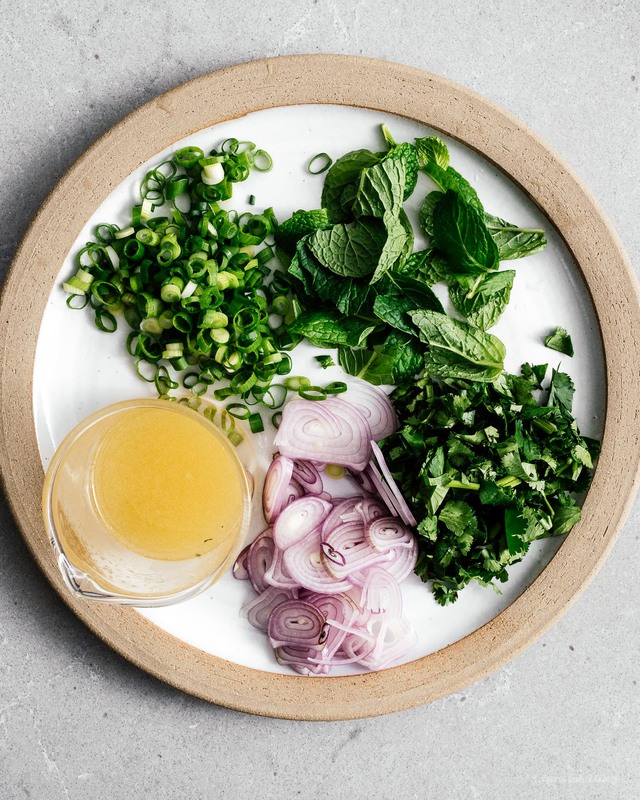 Finish each serving with a sprinkle of crushed peanuts, some sliced serrano and fresh cilantro leaves. 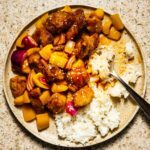 Adobo is the Philippines’ national dish, and it’s not hard to see why: it’s tangy, savory, a little bit sweet, and immensely satisfying. 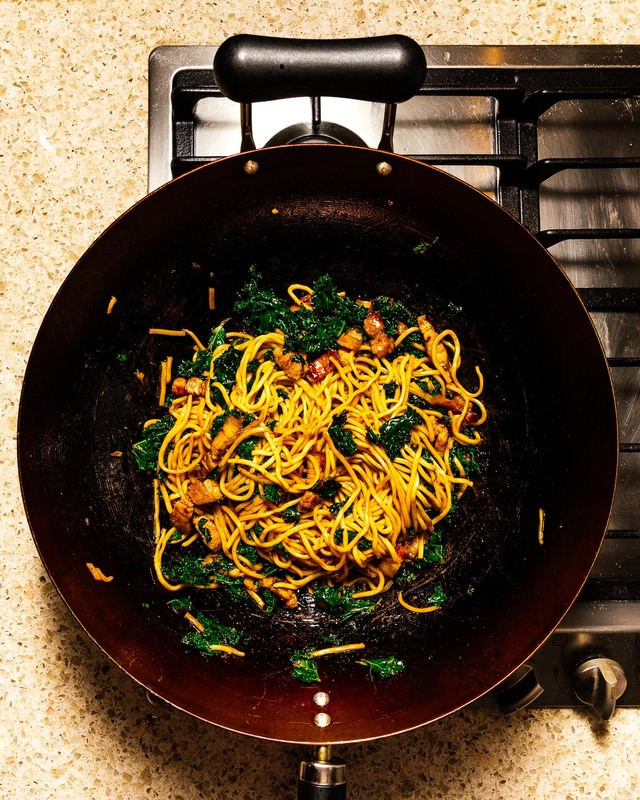 While the protein matters a little bit, it’s the sauce that’s magic: a simple blend of garlic, soy, acid, fond, and fat that’s so much more than the sum of its parts. 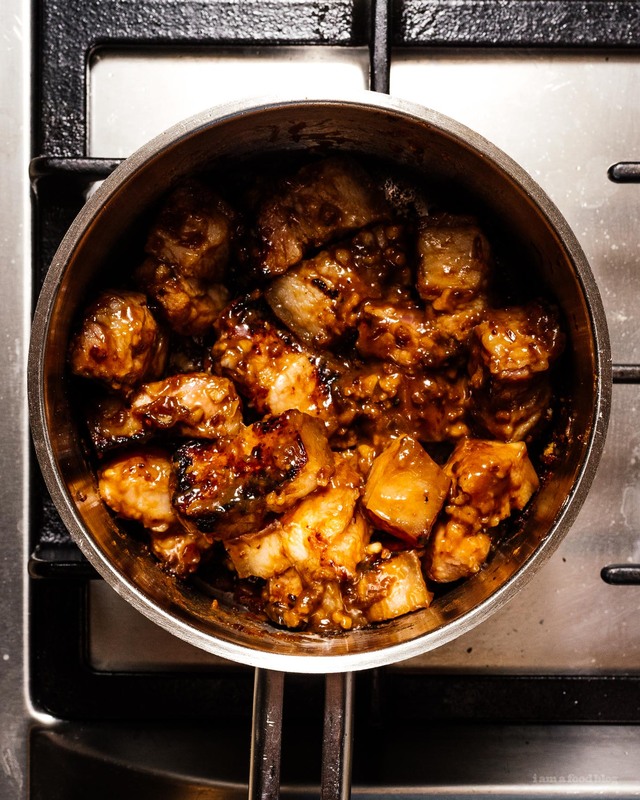 Internationally, chicken adobo is the most popular variant, but over where the dish originates, pork adobo (or even a mix of chicken and pork) is just as popular and it’s always a close race to see which one people prefer. This is the easiest weeknight version of adobo possible: just 6 ingredients, almost no prep time, and dinner will be ready in under an hour. 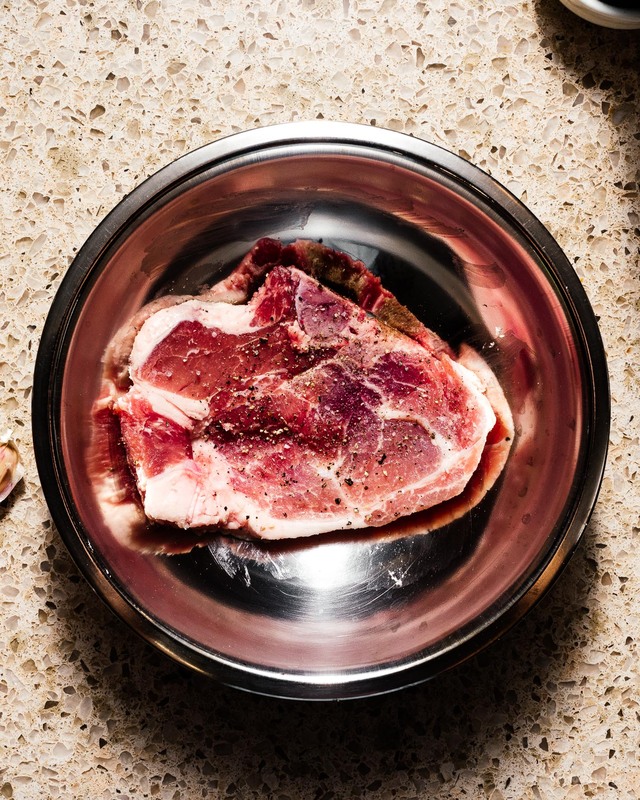 You probably already have everything but the pork chops in your pantry. 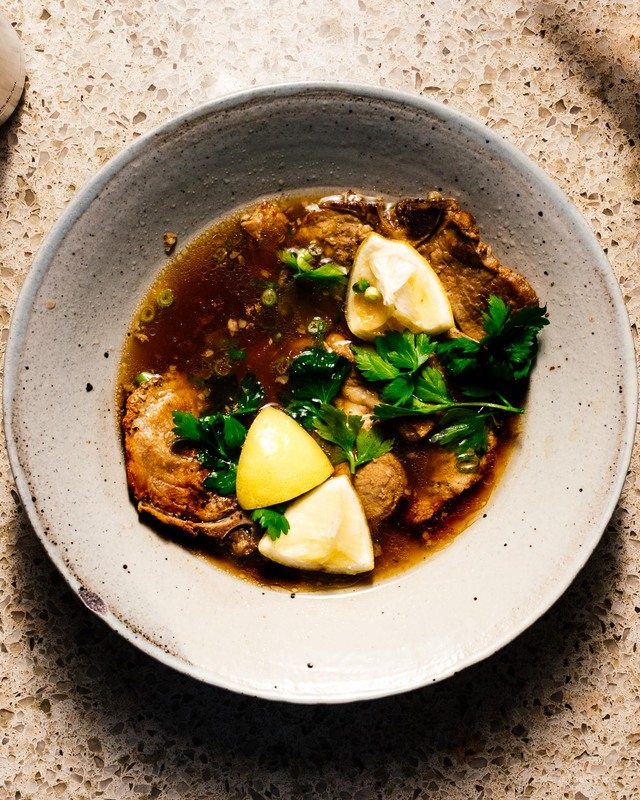 The secret ingredient in this dish is the lemon, which brightens up the dish and, I don’t know about you, but I’d rather buy one lemon than a whole bottle of vinegar any day. Classically this dish uses pork belly or shoulder, but both are not very weeknight-friendly, so here I’ve subbed pork chops instead. 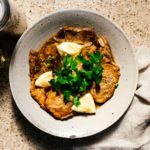 Pork chops are cheap, easy to find, and cook fast, so I think they’re the perfect choice here. You can also use pork belly, shoulder, chicken, or all of the above. The steps are the same no matter which protein you use – it just might take longer before the meat is tender. A pot with a lid. A cheap garlic press will make life great. 1. Season the pork on both sides. 2. 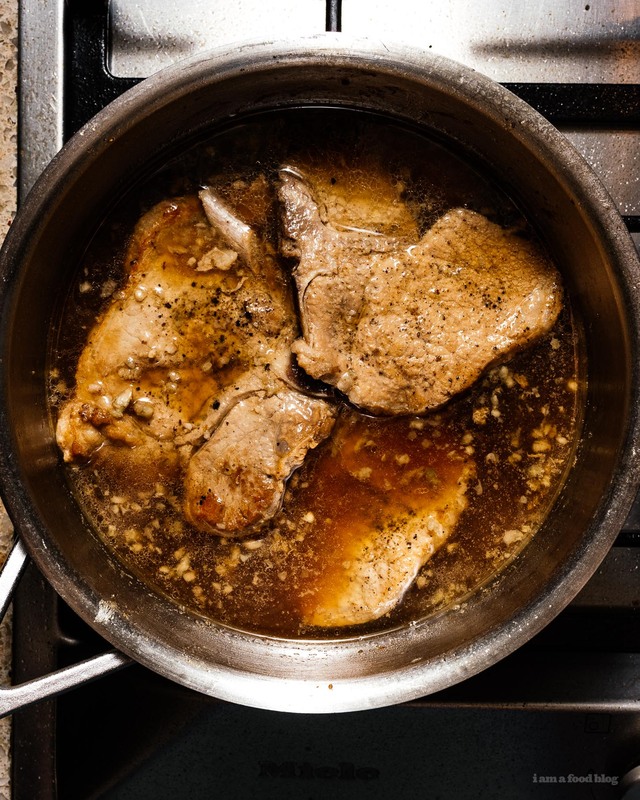 Add 1 tablespoon of oil to a small saucepan or pot and lightly brown the pork chops over medium heat, working in batches if needed. Don’t be afraid to crowd the pan as long as your chops fit on a single layer – it will cut down on the splatter. 3. 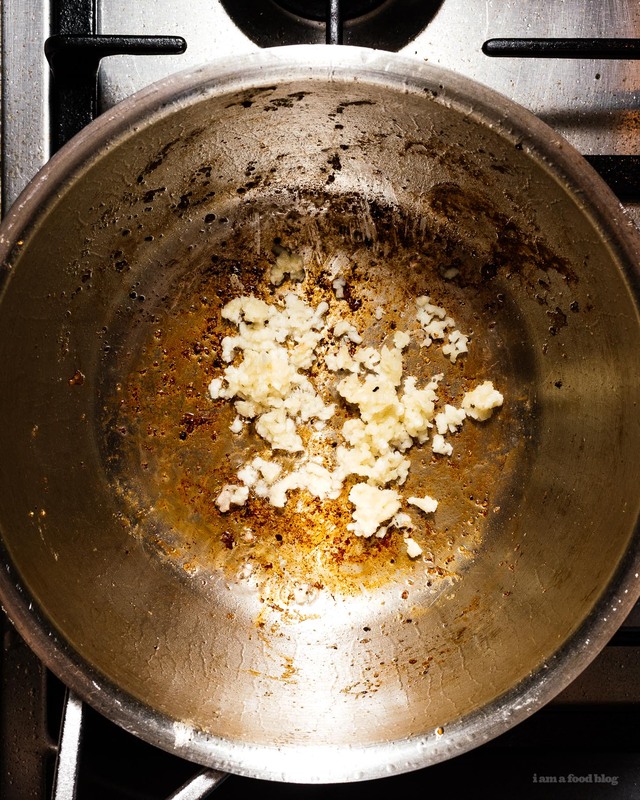 Add more oil if needed and fry the garlic for 1 minute. 4. Add the lemon juice, soy sauce, bay leaf, and sugar to the pan. Gently scrape the bottom of the pan with a wooden spoon to deglaze. 5. Layer the chops and any juices in the pan, then cover with enough water to just cover the top pork chop. Partially cover with a lid and simmer for 40 minutes, or until pork is tender. When done, taste and adjust seasoning – you may need to add another teaspoon of sugar depending on your tastes. If you asked me what my all time go to order for Chinese take away is, it would be sweet and sour pork. No, actually that’s a lie. My all time favorite is honey garlic pork. But this isn’t a post about honey garlic pork, it’s about sweet and sour pork, which happens to be my second all time favorite Chinese takeout item. Who doesn’t love crispy fried pork covered in a sweet and tangy sauce? 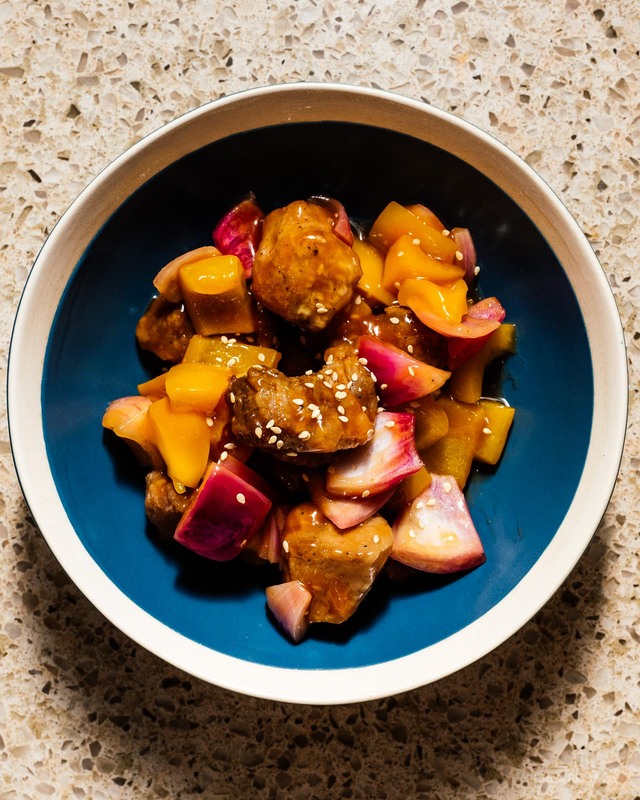 I, for one, wanted to eat the entire plate after making this sweet and sour pork recipe. The only thing that stopped me was a tiny shred of self control. Really though, all I did was sneak into the fridge every so often to fork another piece of pork. Yup, I like sweet and sour pork so much that I eat it cold out of the fridge. Mike thinks I’m crazy, but there’s something so wrong and right with eating cold takeout/delivery food. And this recipe kills it: it totally tastes like delivery – the good kind. 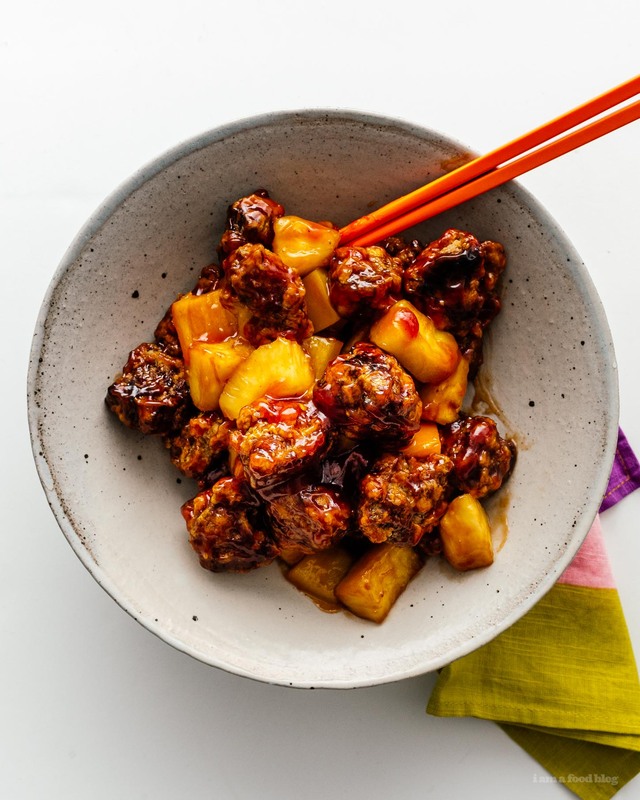 The funny thing about sweet and sour pork is, that unlike a lot of other Chinese takeout dishes, it’s real. Unlike something like, General Tso’s chicken, you can totally go to a real Chinese restaurant and get sweet and sour pork. I’ve even gone on a little sweet and sour pork tour of Hong Kong. It was totally informal and entirely due to the fact that one of my dear friends happens to be a sweet and sour pork fanatic. She researched where all the best places were and we hit all of them up. 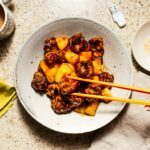 Sweet and sour pork tastes delicious anywhere you have it, whether it’s at home, or on tiny plastic chairs at a round table covered in clear plastic on the neon-lit busy side streets of Hong Kong. 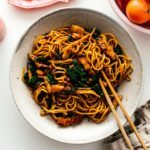 If you’re not going to Hong Kong anytime soon and aren’t inclined to ordering delivery, I hope you give this recipe a try. 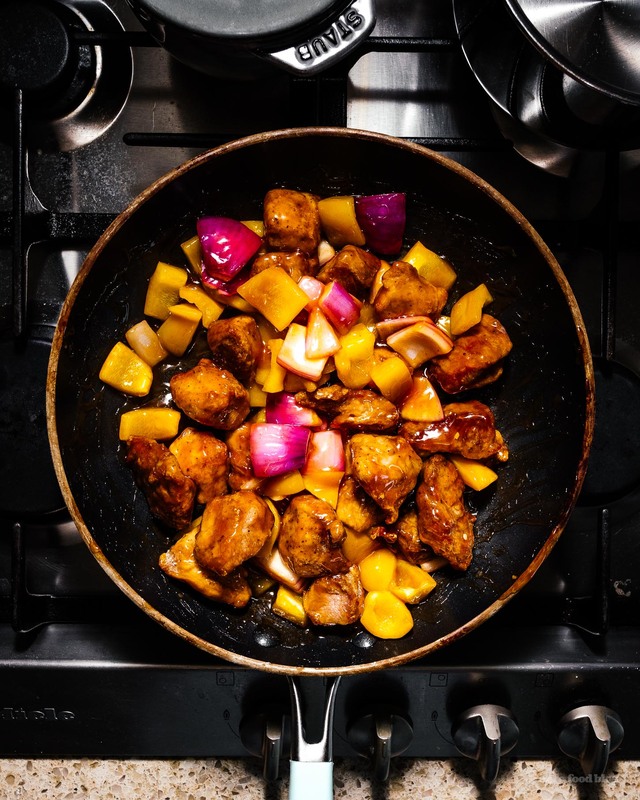 It’s got ultra crispy pork, a tangy glossy sweet sauce, and aesthetically pleasing orange and yellow peppers instead of the classic green ones. It take a bit more time commitment than just opening up an app and ordering, but really, it’s pretty simple. 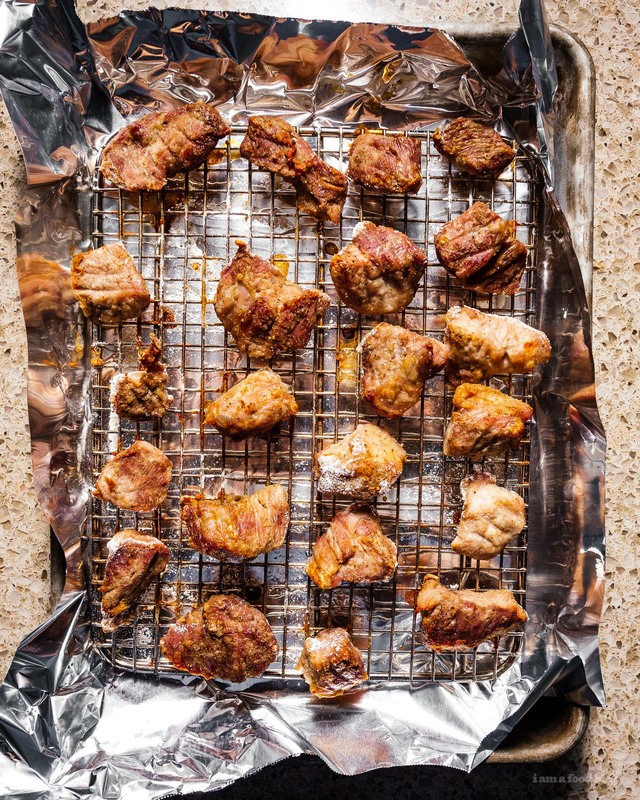 Cubes of pork get marinated in some soy and sugar, then are tossed and coated in a mix of corn and potato starch. The cornstarch is for a light crispiness and the potato starch gives it a more substantial crunch. If you only have cornstarch, that’ll work too, but a combination is best. After everything is coated, heat up an inch or two of oil in a deep pan. You could deep-fry this, but it’s not really necessary, just make sure you turn your pieces of pork so that everything gets submerged in oil at some point. If you’re scared of frying things, you’re not alone – sometimes I even freak out at bit and I’ve deep fried a lot of things in my life. Just remember to not drop anything in from a great height, be sure to use long, heat proof utensils, and wear long sleeves. You’ve got this! Mix the pork together with soy sauce, sugar, salt, and white pepper. 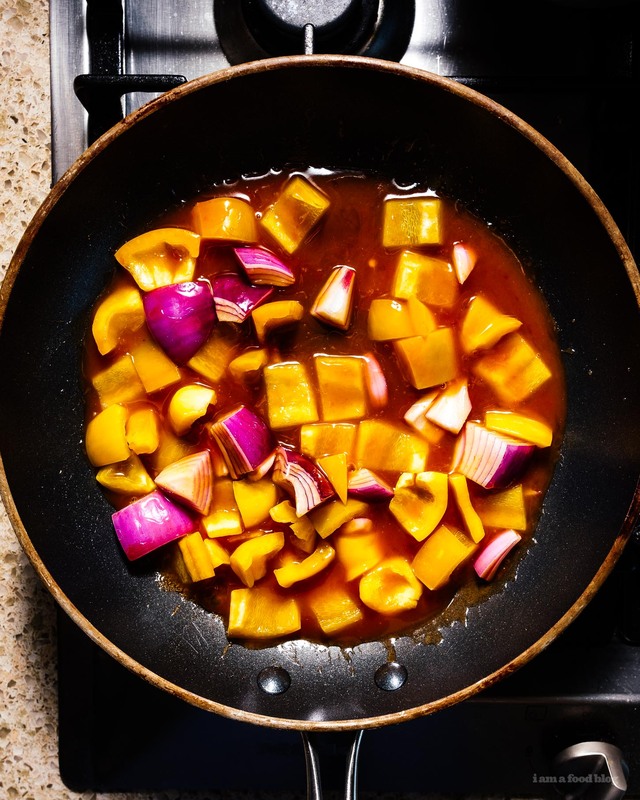 Let marinate, at room temperature (this will help it cook faster than if it’s straight from the fridge) while you prepare the rest of the ingredients. Lightly whisk the egg in a large bowl. In separate bowl, whisk together the cornstarch and potato starch. Set aside. In another small bowl, make the sauce by whisk together the water, sugar, ketchup, rice vinegar, soy sauce and salt. Set aside. Chop the peppers and pineapples. Place a cooling rack over a rimmed baking sheet lined with paper towels. 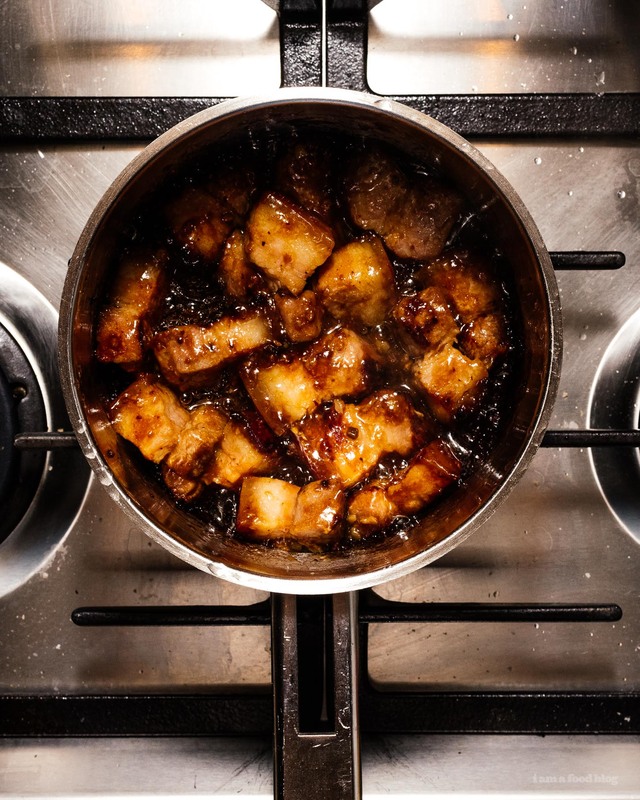 Heat an 1-2 inches of oil in a high-sided, heavy bottomed pot, skillet, or wok over medium high heat until oil reaches 350°F. Work in batches to throughly coat several pieces of pork in the corn/potato starch mix, shaking off the excess. 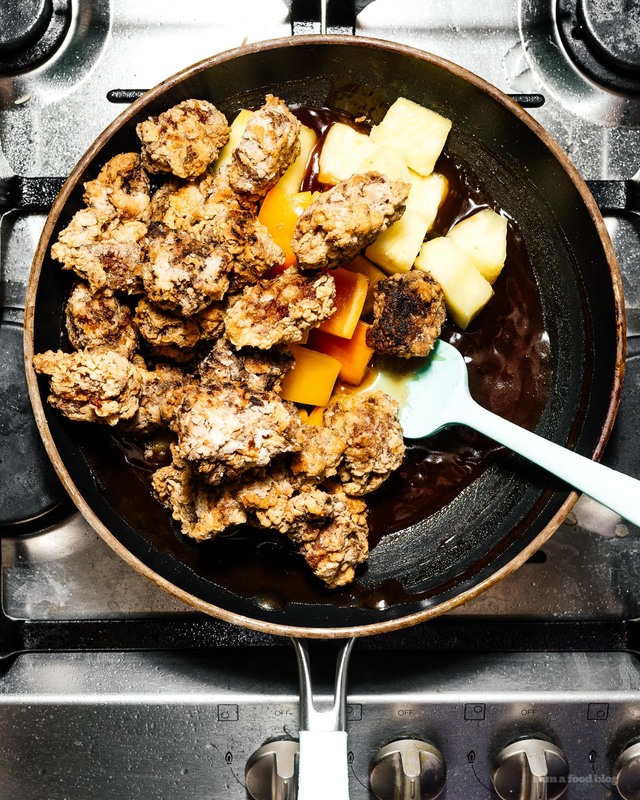 Use a pair of tongs to gently add the pork to the hot oil, being careful not to crowd the pan. Cook until golden brown and crispy, about 5-6 minutes, flipping as needed. Drain the pork on your prepared rack. Repeat until all the pieces are cooked. Add the sauce ingredients a large skillet or sauté pan and bring to a simmer over medium heat. When bubbly, whisk in the 1 tablespoon of cornstarch whisked with 1 tablespoon of water and cook, stirring, until the sauce comes to a boil and starts to thicken. Stir in the peppers and pineapple and remove from the heat. Add the pork and toss throughly to coat and enjoy immediately. Made just for the iPad, “The Better Bacon Book” is a how-to guide for bacon lovers who truly care about food. Tap, swipe, and slide your way through 20 video tutorials on how to make your own bacon, as well as 31 original recipes from the top bacon-obsessed chefs in North America. Learn the history of bacon, then cure, smoke, and fry your own delicious cured pork today. Hey guys! Easter is just about a week away and we’re getting our menu together now. I spend Easter with my in-laws-to-be every year and each year they host a pretty amazing brunch, followed by a pretty epic Easter egg hunt (where I’m the youngest contestant, at 31 years old….and I LIVE for it! lol). Anyway, every year we have a baked ham, as the main entree, which is classic and great, but this year I really want to change things up! 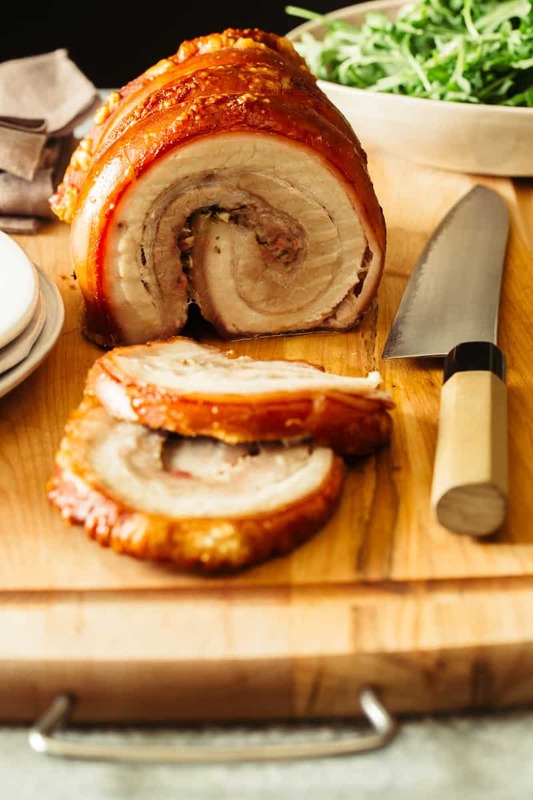 We’re still sticking with pork, but this year we have this gorgeous pork belly porchetta! 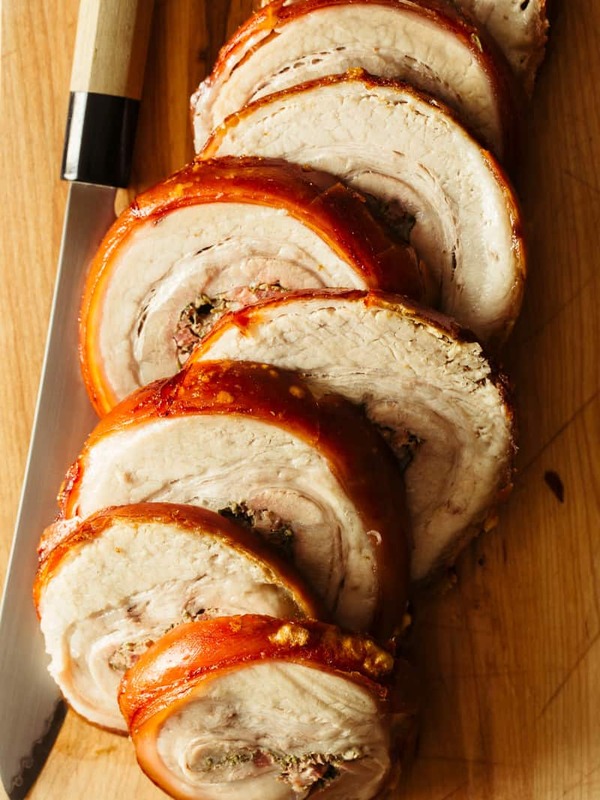 Porchetta is a very moist, boneless pork roast that’s stuffed with aromatics and rolled where the meat and fat are layered and cooked together, flavoring itself as it roasts. Classically this dish has been made with an entirely de-boned pig, but people tend to make it with the pork should these days because it’s much easier to handle but still has a good fat to meat ratio. Today we’ve made ours with pork belly, because it’s SUCH a great cut for something like this! 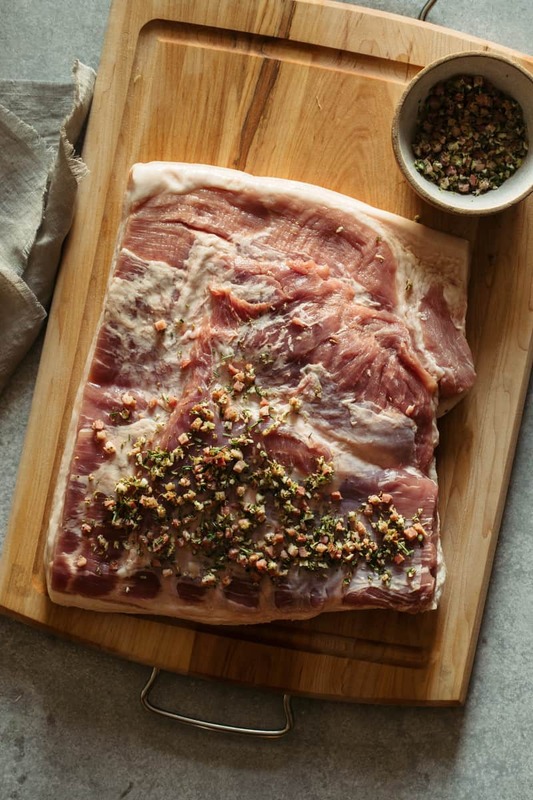 – It’s very important to get skin-on (rind-on) pork belly, to get that crispy, crunchy crust. If you’re having a hard time finding it, you can ask your local butcher to order you some, which they can easily do. You can also visit your local Asian market and they should have skin-on pork belly readily available; the only thing to note is that if you go the standard Asian market route, the meat may not have been humanely butchered/handled, so that might be something to consider. -Many recipes will tell you to cut the skin off the portion of the roast that will get rolled into the meat. They recommend this, because that part of the skin will not be able to crisp up and may turn thick and chewy. In my experience, that portion of the skin/rind is cooked down so much that the texture gets soft enough that I’ve never had an issue with the “toughness” and it ends up getting to be almost gelatinous. I think trying to cut the skin off is way more of a challenge, even with a very sharp knife, so we have left the skin intact for our recipe…but either way, the choice is yours! 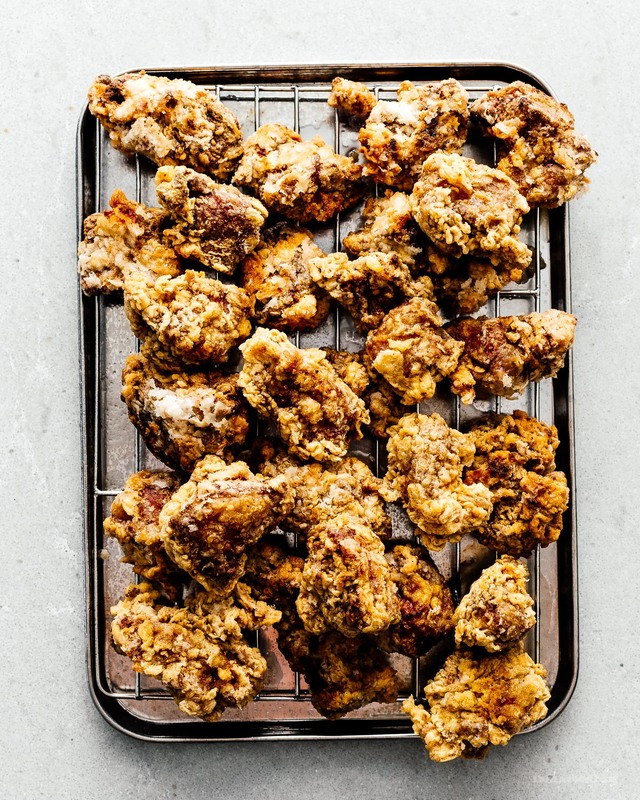 -The spice rub mixture is totally open ended based on your flavor preferences. Garlic, rosemary and fennel seeds are pretty classic, but you can mix it up! I really love the pairing of ginger and pork, so I’ve added some ground ginger to my mixture. I like the dry ginger in this case because it’s way more subtle and I think the fresh ginger flavor would “fight” to much against the bold flavors of the rosemary and fennel. -Tightly rolling the roast is very important here. You can have someone help you roll it up to make it easier. You can also roll the roast, tie it, cut it in half, and freeze half of it for several months, if the full belly is too big. I recommend this over getting a smaller cut because the large piece of meat is easier to handle overall and the next time you want to make it, all you have to do is thaw, pat dry and roast. 1 whole pork belly (skin-on), about 12 lbs. 1. Place all spice rub ingredients into a small mixing bowl and toss together until well combined. 2. 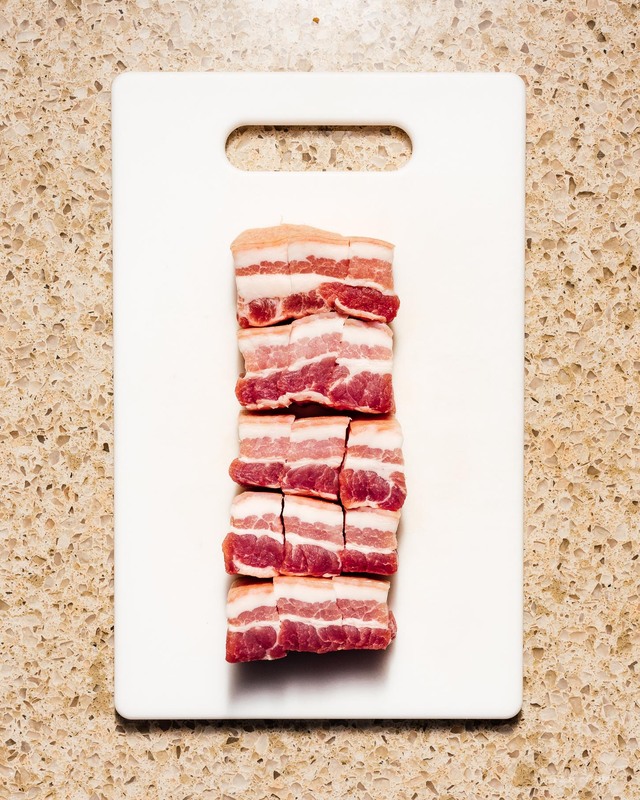 Place the pork belly on a clean surface, skin-side up and score the entire surface with a sharp knife, making sure not to cut into the meat. Pat both sides dry with a paper towel and set the pork belly, skin-side down. 3. Sprinkle the spice rub onto the pork belly and generously rub onto the entire surface of the meat. 4. Very tightly roll the belly into a log, making sure no gaps remain on the inside and tie roast with butchers twine, making ties 1 inch apart (you can use bamboo skewers to help hold the rolled belly together, while tying up with twine). 5. Place rolled roast into a roasting dish and refrigerate, uncovered, for about 6 hours. 6. Preheat oven to 325˚F. 7. In a small mixing bowl, combine sea salt and baking powder. 8. Pat porchetta dry with a paper towel and generously rub with salt and baking powder mixture. 9. Roast porchetta for about 1 hour and 45 minutes or until the internal temperature reaches 160˚F, basting every 30 minutes. Then continue to roast for an additional 1hr 30 minutes or until the meat, passed the skin, is soft and tender. 10. Increase oven temperature to 450˚F and roast for about 20 minutes, to get the skin extra crispy. 11. 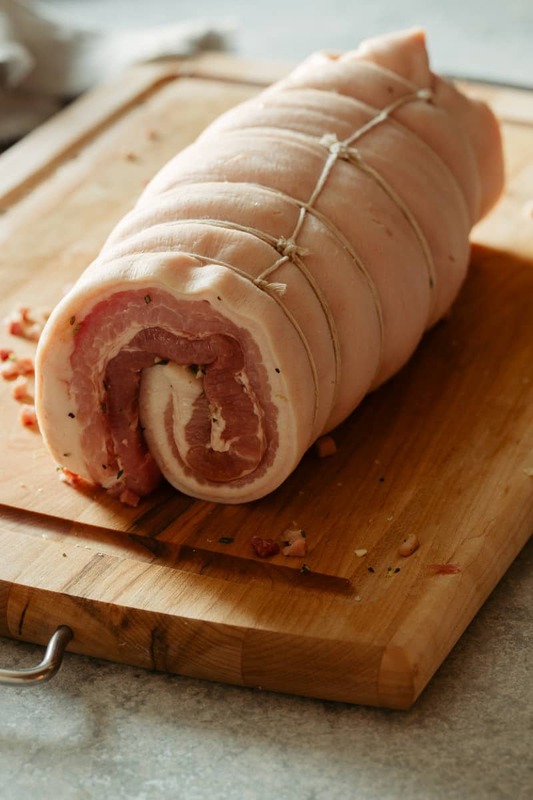 Remove from the oven and allow porchetta to rest for about 15 minutes. Thinly slice with a serrated knife and serve.